When spring returns, Denver garage door owners might be surprised to see that their garage floor has become stained, yet they cannot recall having spilled anything in the area. Truth be told, the culprit is actually something that was designed for your safety. Each year chemicals and salts are poured on roads to aid in the deicing on the asphalt, and these substances do build up on the underside of your car and find their way into your garage. As the snow melts off of your vehicle, it carries these chemicals down to your garage floor along with them, where they etch their way into the concrete. The Denver garage door installation and repair team at Colorado Overhead Door Company share some tips to help you remove these stains and restore your garage floor to its original state. How do Road Salts Damage Garage Floors? Road salts are made up of liquid magnesium and calcium chloride, and while this combination has the powers to lower the freezing temperatures of the roads, overtime its chemical composition becomes diluted and useless. How does this end up damaging your garage floor? Good question. As stated earlier, as these chemicals make their way from the road to your car, they eventually make their way onto the surface of your garage’s floor. From there they make their way into the small pores in the concrete where they sit and dilute until they become a liquid brine. Once they have reached a certain point of lower concentration, the mixture itself can now freeze. When the temperatures drop below the freezing point once again the mixture freezes and, as you might remember from science class, expands. Given that it has made its way into the small pores of your floor, this expansion causes the concrete to crack. Given Colorado’s harsh winters, Denver garages will see the temperature drop below freezing over and over again for many months. This gives the liquid brine the chance to expand and contract multiple times, eventually causing the concrete to break away. This process is called spalling, and it is not limited to only deicing chemicals, as water can also work its way into the pores of your flooring. For this reason, many Colorado garage owners would be smart to invest in snow mats that absorb and collect the water that falls off of your vehicle. Spalling is not the only problem faced, as another reaction called subflorescence can also take place. Subflorescence takes place when all of the moisture has evaporated out of your garage and leaves behind the salts. The salt then crystalizes into your concretes pores where it will eventually cause the floor to start flaking off. Check back later in the week as Colorado Overhead Door Company teaches you how to restore your garage floor to its normal condition. Spalling and subfloresence have always pestered Denver garage owners, but by learning how to repair and prevent these spots you can now combat the problem before it takes place. 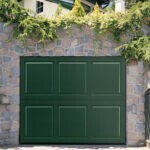 Should you be in the market for a new garage, give Denver’s leading garage door sales team a call. Their experience in dealing within Colorado’s Front Range area makes them the perfect team to help you select, install and winter-proof your garage.